Since 1998, Lineage has been a staple of the South Korean games industry. Generating over $2 billion in terms of lifetime revenues, the PC MMORPG series spawned sequel Lineage II in 2003, and as recently as 2016 the pair accounted for almost half of publisher NCSoft’s annual revenue. And then something significant happened. Revenues jumped, peaking in Q4 2016 before dropping 50 per cent in the following quarter. They’ve continued to fall ever since. The reason – of course – was the release of mobile game Lineage II: Revolution. It wasn’t that NCSoft hadn’t released mobile games or even mobile Lineage games before, just they’d never gained any traction. Ironically, then, it took upstart Netmarble, formed out of Korean entertainment conglomerate CJ E&M and part-funded by Chinese giant Tencent (which remains a significant shareholder), to highlight just how valuable the Lineage brand remained, if correctly handled. Released in December 2016, Lineage II: Revolution was an immediate hit for Netmarble, and by default NCSoft too, thanks to the royalties it received and the Halo Effect that boosted the revenues of the original PC version of Lineage, if only for a short time. At this point it’s also worth noting NCSoft has a 6.9 per cent stake in Netmarble. It’s the result of a strategic partnership and share swap NCSoft carried out to fend off a hostile takeover bid from Nexon in 2015: such are the machinations of Korean business. And this was the foundation for the licensing agreement that eventually produced Lineage II: Revolution. Setting records for the most money a game had generated in Korea within 30 days of launch ($176 million), Lineage II: Revolution was an immediate smash hit. That uplift of revenue and, more importantly profitability, proved to be very useful for Netmarble given it was planning to IPO. Fuelled by the game’s continued popularity – Lineage II: Revolution was the top grossing mobile game globally in early 2017 – Netmarble became the largest South Korea IPO in seven years. Valued at $12 billion, the float also raised a $2.3 billion warchest for Netmarble to use for future operations and acquisitions. The story was just beginning however. Launched in June 2017 on the back of 5.5 million pre-registrations, NCSoft’s Lineage M blew Lineage II: Revolution’s record for 30 day sales out of the water, raking in $233 million. It generated around $500 million during its first quarter, in the process boosting NCSoft’s sales by 181 per cent. Indeed, each game generated over $1 billion during their first year, doubling Lineage’s lifetime revenue total in a 20th of the time. The result also boosted the value of the South Korean games market 80 per cent between 2015 and 2017. You couldn’t have a more dramatic demonstration of the velocity of the free-to-play mobile games sector compared to the legacy PC game subscription market. Yet this story is more nuanced than a simple story of much loved PC games’ successful transition to mobile. The cultural significance of Lineage to South Korean games provided those initial high levels of engagement when Lineage II: Revolution and Lineage M were released. Neither game has managed to sustain that trajectory, however, nor have Netmarble and NCSoft managed to replicate this local success globally. The result is Lineage II: Revolution’s quarterly sales have fallen by a third since their peak, while Lineage M is down over 50 per cent. They remain incredibly lucrative, of course, providing 65 per cent of NCSoft’s total sales and 35 per cent of Netmarble’s. But according to one measure of their ability to generate increasing levels of profits – company share price – the view is they’re yesterday’s news. 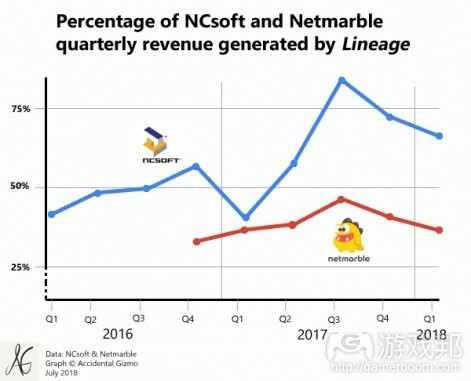 NCSoft’s share price is broadly similar to what it was when Lineage M launched, while Netmarble’s is the same as when it floated. Investors, at least, are betting the games will continue at the same level. This could be a mistake given the whole point of games-as-a-service is to provide developers with the opportunity to optimise their engagement and monetisation over time. That’s why games such as Candy Crush Saga can increase their sales years after they were launched and from a much smaller user base. On the other hand, the incredible launch months of Lineage II: Revolution and Lineage M were clearly unsustainable in the long run.